If you host meetings with attendees outside of your company, you know how disruptive it can be sometimes when your attendees have trouble joining your meeting. It might be because they are unfamiliar with your conferencing solution, or they join only to find that they cannot access critical features, like screen sharing. 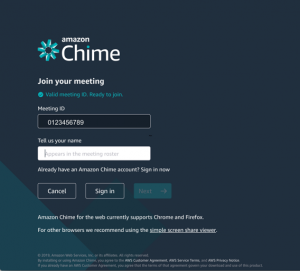 The Amazon Chime web application makes it more efficient to host and join meetings from any device with a supported browser. This includes devices running Linux or Chrome OS, without downloading or installing the Amazon Chime client. 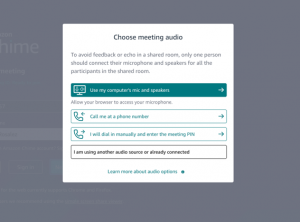 Amazon Chime’s web application prioritizes getting your attendees into your meetings quickly. Then once they have joined, it provides them a resourceful meeting experience that is complete with audio, video, and screen sharing. They can enjoy such features as notifications when meetings start, access to host controls, and the complete Amazon Chime chat experience. For any meeting to be productive, it has to start smoothly. With the web application, you can schedule meetings with confidence knowing that critical prospects and customers can join meetings without difficulty. 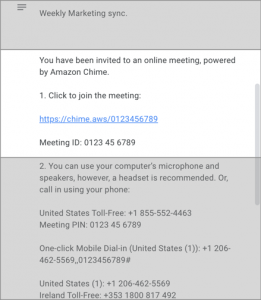 When you schedule a meeting with Amazon Chime, the calendar invite includes a meeting link in the meeting details. External attendees joining from their computer can open this link, enter their display name, choose their audio source, and begin participating in your meeting. Attendees choose the join link provided in the Amazon Chime meeting details. Attendees enter a display name that will appear in the meeting roster. The meeting loads and displays the roster and meeting controls. Attendees on Google Chrome or Mozilla Firefox can participate in the entire Amazon Chime web application experience. They can chat in meetings, view and share video, use the meeting roster, view screens, and join meetings on their phone or by using high-definition audio through their computer. Attendees on Google Chrome can also share their screen. When your meeting attendees join by using the web application, they can share content with you if they are in Google Chrome. In the Amazon Chime Window, choose the Screen option. Attendees can then share their entire desktop, a single application window, or a browser tab. After selecting one of the three options, and the content they want to share, their content appears for other users. A notification appears at the bottom of their browser indicating that content is being shared. 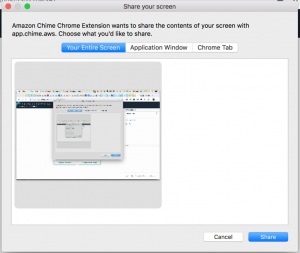 Before sharing content in the web application, attendees must install the Amazon Chime Screen share extension from the Google Chrome Web Store. When possible, they should download this extension before your meeting to lessen disruption. Otherwise, they are prompted to install it when they select the Start screen share option. After installing the extension, they must choose the Start screen share option again. Chat is an important part of the collaboration experience. When a meeting isn’t necessary, and email isn’t fast enough, chat lets you rapidly connect with people. 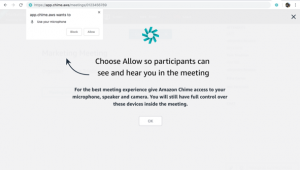 This new web application helps make sure that users on the web had the full benefit of the Amazon Chime chat experience. When you sign in to the web application, you find the recent enhancements. These include an emoji picker, in-line GIF support, rich text support with Markdown, and updated search. The web application unlocks the Amazon Chime experience in the browser for new and veteran Amazon Chime users alike. For more information about compatibility and features are available in our documentation. Try it today and let us know what you think. Ryan is a Senior Product Manager for Amazon Chime, a pay-as-you-go communications service that lets users collaborate with the security of AWS for online meetings, video conferencing, calls, and chat. Ryan has worked for Amazon Web Services since 2016.